Anchor pillar candles in Mason jars among a bed of candy corn or black and orange jelly beans for a simple and festive Halloween decoration for the tabletop or porch. Lure visitors with a spiderweb doormat. Step 1: Purchase an indoor/outdoor needle-punch carpet ($3.70 for one square yard; Caldwell Carpet, 800-772-7090). To turn it into a circle: Mark the rug's center point with a Prismacolor white-colored pencil (88 cents; dickblick.com). Measure and mark the distance from that point to a spot about half an inch from the rug's edge. Cut a piece of string to that length. Tie one end of the string to the pencil and secure the other end of the string to the rug's center point with a tack. Pull the string taut and draw a large circle onto the rug; remove the string. Cut out the circle, just inside the white pencil mark, with sharp scissors. Step 2: Using a yardstick, evenly space and draw eight intersecting lines that cross the rug from edge to edge. Between those lines, draw arches around the mat, using our photo as a guide. 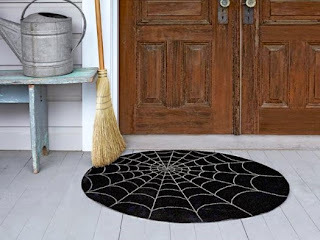 Step 3: Lastly, coat the rug with a clear finishing spray (Krylon Make It Last Clear Sealer, $3.99; joann.com) to protect your web from trick-or-treating feet. Turn orange tissue-paper balls into proper Halloween pumpkins. Simply cut facial features and stems from construction paper and apply to the balls with glue dots. 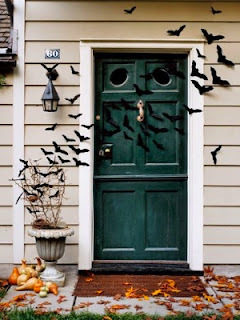 These felt bats are easy to make and ensure your house looks extra spooky. All you need to do is trace a bat shape onto a piece of felt and cut it out. Repeat until you have a swarm of them. 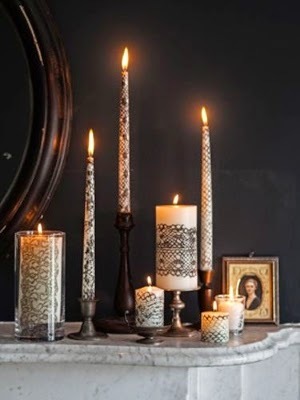 Cast a few dark shadows with these glamorous candles. 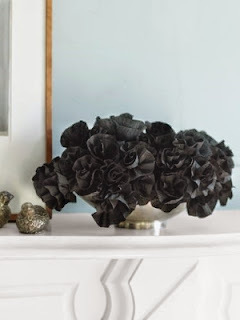 Just cut a length of lace, lay it on a paper plate, and brush on nontoxic, nonflammable black tempera paint. 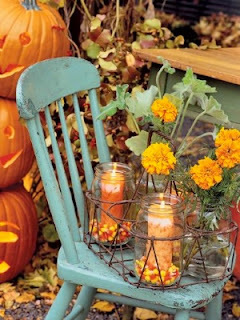 Roll a pillar, taper, or votive across the trim to pick up the pattern. Don't worry if the transfer is imperfect—a slightly decayed look up ups the elegance. 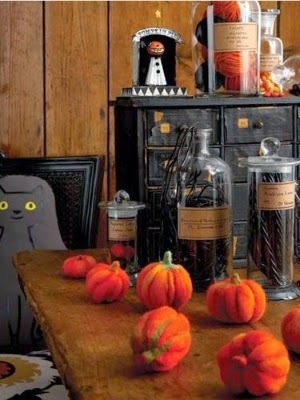 Then, let the paint dry for at least an hour before lighting the candle. Or, decorate a glass holder by cutting a strip of lace-printed tape ($7 for 27 1/2 yards; tapeswell.com) to fit the vessel and adhering it to the outer surface. Treat guests to a surprise right at the door with candy-filled cones nestled in a vintage plant stand aflutter with feathered crows. Step 1: To create a cone about 10 inches long, first wrap an 8 1/2" by 11" sheet of heavyweight white paper on the diagonal. Trim excess paper. Use this as a template to cut as many cones as desired. Step 2: Shaping each cone according to the template, use pinking shears to cut a band of glossy orange paper about 4 inches wide for the middle of the cone, and a band of yellow paper about 3 inches wide for the top. Affix the orange and yellow bands to the white base, then join the ends of the cone together using double-sided tape. Just as Charlotte's webs attracted admirers, so too will these delicate displays. 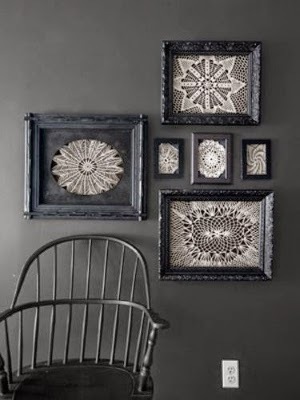 Using tape or tacks, secure vintage doilies to the open backs of black frames. The white crochet looks especially moody hung on a deep-hued wall. 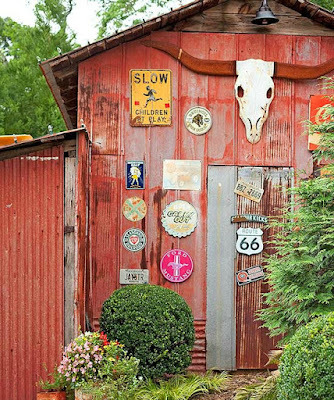 This craft pairs materials from your own yard with an 11¼"W x 14"H black Funkin ($36; funkins.com). 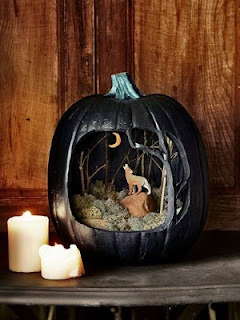 To get started, print our carving templates; cut, as indicated, to create stencils for the tree-framed opening and moon at the back. 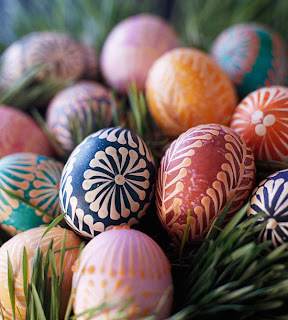 With a felt-tip pen, trace the designs onto your Funkin, then carve. Spray-paint the Funkin's interior black (Krylon Colormaster, $6.49 for 12 oz. ; amazon.com); let dry one hour. Place a green Styrofoam disk inside the faux pumpkin as a base. Using our photo as a guide, stick twigs into the base to form trees, then cover the base with moss (disk, $3.99; 6"W x 2"H, hobbylobby.com; moss, $16.92 for 8 oz. 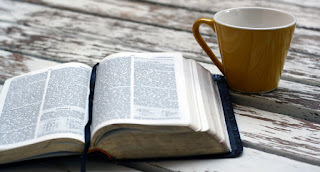 ; amazon.com). Finally, hot-glue a wolf figurine to a rock, and set it and other rocks atop the moss (plastic wolf, $5; 1½"L; amazon.com). 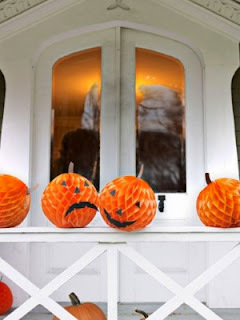 To create this embellishment, you'll need about eight dozen glow-in-the-dark rubber eyeballs ($7.99 for 12; amazon.com) and a 12-inch foam wreath form ($2.59 for three; createforless.com). Wrap the form in black crepe streamers and secure with straight pins. Poke a hole in the back of one eyeball with the sharp end of a flatheaded pin; then insert the pin's flat end into the hole. Using a thimble to protect your finger, press the pin halfway in. Push the sharp end of the pin into the form. 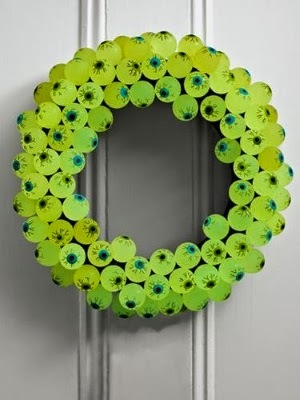 Repeat until the wreath is full and hang as desired. 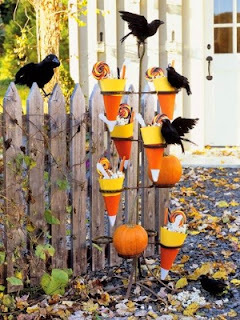 To make these clever covers for candy suckers, download a tombstone image and follow the steps below: Step 1: For each lollipop, print and cut out two tombstones, then glue them, faceup, to a sheet of black construction paper with a glue stick. 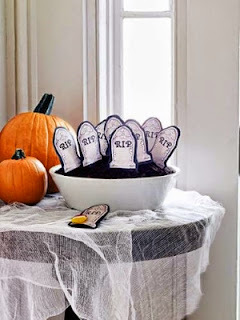 When dry, cut around each tombstone, leaving a black construction-paper border, as shown. Step 2: Turn one tombstone facedown and glide the glue stick along its outer edges at the top and sides only. Place the other tombstone on top of it, faceup. Press the edges together to create one cover. Let dry. Step 3: Use a fine-tipped black Sharpie to spell out "RIP" — or a guest's name — on one side. Step 4: Repeat directions above to create additional lollipop covers. Insert candy. 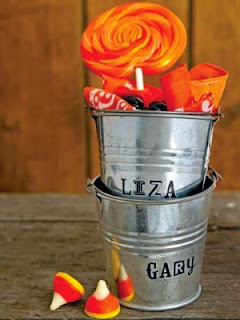 Place floral foam in a bowl and stand lollipops in the foam. Then fill the bowl with crushed Oreos to serve as the dirt in your graveyard. Make a bunch of these dark blooms and fill a bowl with them for a spooky floral arrangement. Step 1: Bend an 18-inch-long piece of floral wire in half and wrap double-sided tape around the bent end about five times. Step 2: Hold the tip of a streamer, still attached to its roll, against the top of the taped wire. Then loosely wrap it around the wire four times to create an inner bud, pinching the bottom edge of the streamer against the taped wire as you go. Step 3: Continue wrapping the streamer around the wire, gathering the paper at the flower's base so that the petals fan out at the top. Continue until you have a full flower. 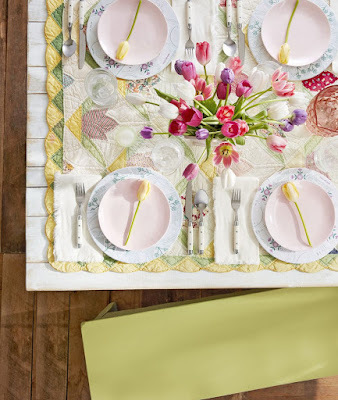 Finish by cutting and securing the flower to the wire with floral tape. Repeat until you have enough blooms to fill a bowl. Personalize galvanized buckets with adhesive or rub-on letters for a Halloween table. 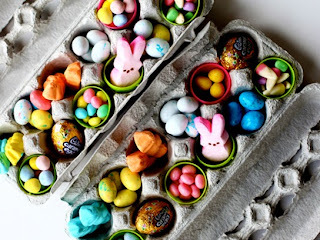 Fill with treats for guests to take home at the end of the party.